Now you can make the Kessel Run in less than 12 parsecs with the Flying Star Wars Ultimate Millennium Falcon! Fly the most iconic ship in the Star Wars universe right in your own home! The Ultimate Millennium Falcon takes flight with the power of 4 rotors concealed in the body of the ship. Its authentic lights and sounds bring the Millennium Falcon to life as you fly. Activate Hyperspace mode on the remote control and hold on for a fully loaded hyperspace journey. If your deflector shields go down, you’re still in good shape; the Millennium Falcon is constructed from durable high density foam making it resilient to a few photon torpedo hits. 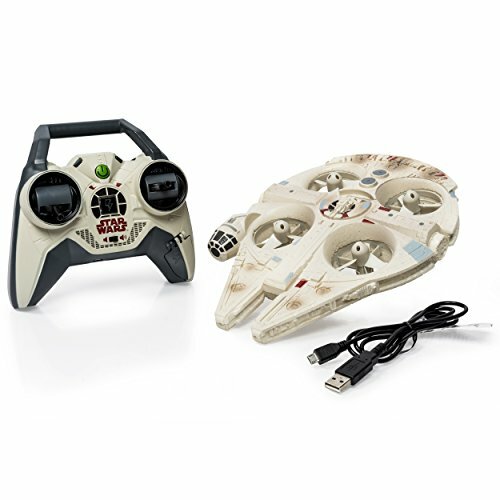 With 2.4GHz communication, you can control the Millennium Falcon up to 200 feet away! Join the rebellion and bring Star Wars home with the Millennium Falcon Quad from Air Hogs! Star Wars products are produced by Spin Master under license from Lucasfilm Ltd. If you have any questions about this product by Air Hogs, contact us by completing and submitting the form below. If you are looking for a specif part number, please include it with your message.